As I mentioned last week, I find macro photography to be very therapeutic. While I frequently drift from my landscape photography focus, macro photography is very similar; the compositions are just on a smaller scale. About this time last year, I finished working on a custom macro lens. While sitting at home on a rainy weekend it occurred to me that I hadn’t tried it out on my new Canon 7D. The sensor format of the 7D gives it even more magnification than I get on my 5D. 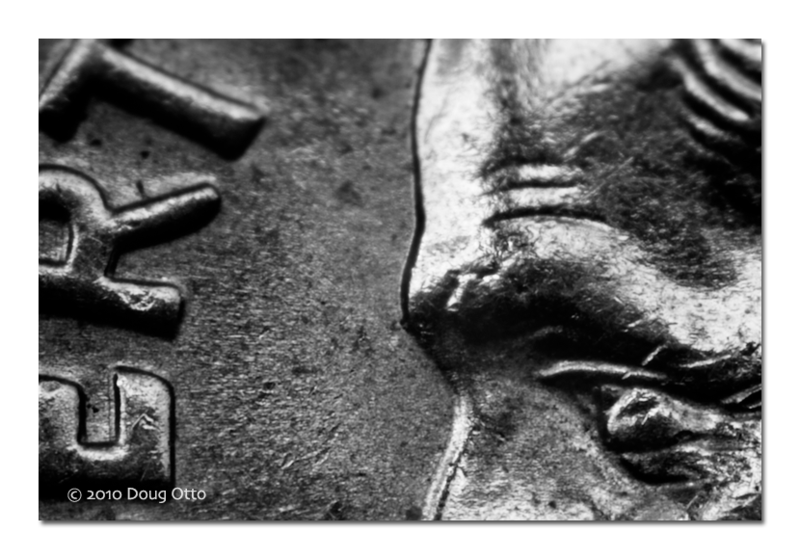 This image is a photograph of a small portion of a US dime. The area depicted is less than 5/16″ across. My, just turned 45 eyes, can’t even focus on it without my readers. This entry was posted in Photography and tagged canon 18-55, Canon 7D, dime, doug otto, high magnification, macro, Photography. Bookmark the permalink.